Last year I had Taylor Swift telling me I'd be feeling miserable and magical whilst I was happy, free, confused and lonely at the same time and this year, if I listen to Blink 182 well.... no one's going to like me for the next 12 months from tomorrow onwards. I mean, it worked on Jesse so perhaps it'll work on you too? These brownies were actually a happy accident. My initial intention was to make peanut butter protein brownies, as per Jesse's request, however, half way through I ran out of peanut butter (THE HORROR!) and the only other nut butter alternative I had around was nutella. I could have halved the recipe and just gone with the peanut butter, however, who was I to deny nutella?! 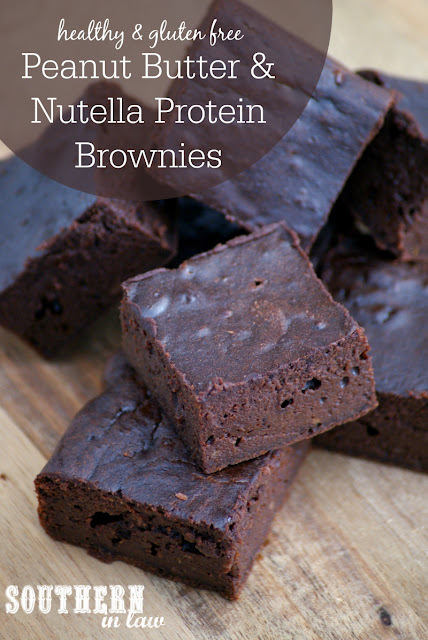 So the nutella was mixed into the protein brownie mix and heaven was made! Since then we've tried them both with using just nutella and just peanut butter, however, we've decided that combining the two gives you the best taste and texture! Melt your peanut butter and nutella over a double boiler (simply a heatproof bowl placed over a pot of boiling water), carefully stirring until smooth. Once your nut butter mixture is melted and smooth, remove from the heat and mix in your cocoa powder, pumpkin and sugar until smooth. Add in your eggs, mixing until smooth. Carefully add in your protein powder, mixing until smooth. It may take a little bit of time to mix in your protein powder but you'll get there! Pour your brownie mixture into your tin, smoothing out and topping with melted PB if desired. Bake for 20-30 minutes, or until cooked through and a skewer inserted into the centre removes with a few moist crumbs. 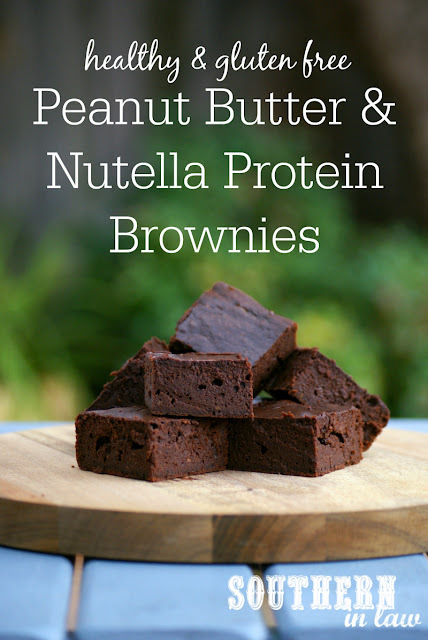 You don't want to overcook your brownies as you want them to be moist and fudgy! Allow your brownies to cool before slicing and serving. Here's where Jesse and I are debating what's best - I say leave them in the fridge to chill overnight before eating (so they're super fudgy) whilst Jesse likes them at room temperature. I'll leave it up to you to decide what you prefer! These brownies will keep for 2-3 days in an airtight container in the fridge or at room temperature and also freeze brilliantly. To freeze, simply place individual brownies in freezer bags or wrap them in cling wrap and then place them into a zip lock bag to freeze. Defrost whenever you're ready to eat them either in the microwave or in the fridge overnight. *As I mentioned above, you can use 1/2 cup nutella or peanut butter or almond butter (or your favourite nut butter), however, we find you get the best texture and taste when mixing both. Play around with it and make it your own! **We find pumpkin gives a super fudgy and delicious texture and applesauce does almost exactly the same. We have some friends who can't have pumpkin or apple and tried a version with banana which worked brilliantly, however, you can taste the banana. ***We don't like things super sweet so we used 1/4 cup coconut sugar with unsweetened protein powder. Use more/less depending on your taste as well as whether or not your protein powder is sweetened. 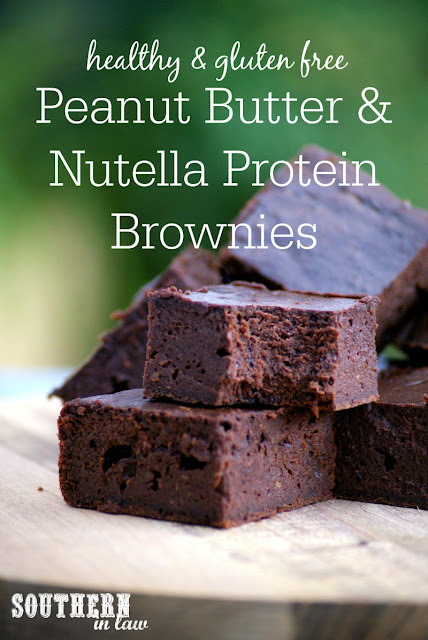 ****We have had the most success using either brown rice protein, peanut flour or whey protein powder. Please don't use a "protein shake mix" (also known as a meal replacement shake) as this won't work. But tell me, what's one food that you could be bribed with? And do you like brownies cold or room temp?